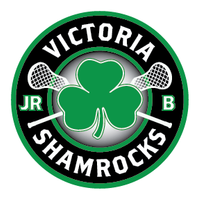 The Jr. Shamrocks won their season series against the New Westminster Salmonbellies as they needed overtime to pull out a 14-13 victory at the Q Centre Saturday. It was their second win against the Bellies to take the series 2-1. Unfortunately, they did not have the same success on the road against the Coquitlam Adanacs Sunday as they fell 14-9 to the league leaders. Starting goaltenders in Saturday’s game were Erik Kratz for the visitors and Cam Dunkerley for the home team. New West got their offense going early, opening up a 2-goal lead as Dalton Lupul scored a shorthanded marker 2:09 into the period. Cam Garlin made it 2-0 at 5:22 putting the ball over the goaltender. Victoria responded at 11:05 when Brayden Brown got in close to beat Kratz but the visitors would add a pair before the period ended, the first coming just 29 seconds after Brown’s tally, Ryan Jones with a bit of a floater that eluded Dunkerley. Carter Dickson made it 4-1 ‘Bellies at 18:35, getting in close and that is how the first period ended, despite Victoria holding a 16-13 edge in shots on goal. Victoria got within a pair of goals early in period 2, Austin Madronic picking up a rebound in the defensive zone and going coast-to-coast to score unassisted at the 35-second mark. New West once again put together a 2-goal string, Lupul getting his second just 10 seconds later and Nathaniel Kozevnikov making it 6-2 Salmonbellies at 1:45 with a bouncer on the run. 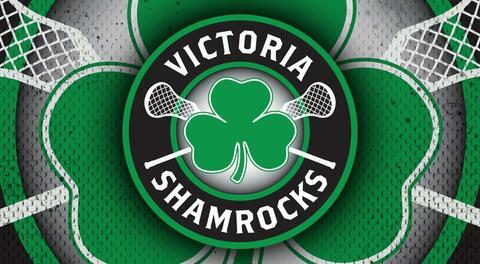 The Shamrocks suddenly caught fire rattling off 5 straight before New West again found the back of the net. First it was Eddie Smith scoring at 5:10, a shot that Kratz couldn’t quite corral. Braylon Lumb scored at 6:07 from inside the dotted line and Ben Preston added another just 31 seconds later. Marshal King got the score knotted at 6 with a shot from a bad angle at 10:13 and gave the home team its first lead of the game at 11:09 with a hard shot from outside the dotted line. New Westminster replied at 11:24, Drew Andre with an unassisted marker. Victoria added a couple more before the period ended, the first a shorthanded goal off the stick of Zach Manns who grabbed a loose ball and went in to score unassisted. King picked up his hat trick goal at 19:17, ,getting in close to finish off some good ball control. That gave the home team a 2-goal lead, up 9-7after 40 minutes. The Shamrocks extended the lead to 3 goals 2:55 into the final frame, Skyler Wilson getting a shorthanded goal off a breakout pass from Dunkerley to Gabe Harman with the Rocks playing 3-on-4. New Westminster bounced back with 3 straight to tie the score, the first two courtesy of Keegan Bell, and the first coming on the power play at 6:14 on a bullet from outside the dotted line. He added another at 7:33 getting in close and Jones got the visitors even at the 8-minute mark, picking up his second of the game. The teams traded goals, Victoria pulling ahead with a power play goal from King, his fourth, at 10:39 with a hard, low shot from outside the dotted line only to have Will Malcolm reply for the visitors at 14:01. New West took the lead just 42 seconds later, Garlin picking up his second in close on a quick stick. Brown collected his second for the Shamrocks at 16:40 with a bullet from outside the dotted line to knot the score at 12. That sent the game into a 10-minute overtime period. Victoria took the lead just 24 seconds into the extra frame, an unassisted goal on a bullet from the dotted line, the second of the game for Manns. The ‘Bellies came back at 2:44, Andre getting his second of the game and it stayed tied until the 8:18 mark when Braylon Lumb scored unassisted, grabbing a rebound in close and with Kratz down to not only win the game but also pick up his 100th point of the season. 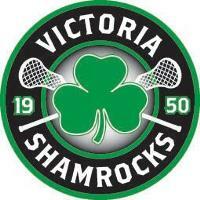 Leading the way offensively for the Shamrocks was Marshal King with 4 goals and 3 assists. Zach Manns and Brayden Brown each had a pair of goals and 1 assist while Braylon Lumb had a pair of each. Ben Preston had a goal and 2 helpers with other goals coming from Austin Madronic, Eddie Smith, and Skyler Wilson. Brad McCulley and Jackson Boyd added 4 and 3 assists respectively. Cam Dunkerley made 41 saves to pick up the win and once again the Shamrocks were very efficient in the faceoff circle, Zack Homer winning 16 of 26 and David Byrne winning all 4 of those he took. The Shamrocks were neck-and-neck with Coquitlam on Sunday through the first period, the teams tied 4-4 after one but the Adanacs pulled away in the second to lead 11-5 after 40 minutes and handed the Rocks a 14-9 loss in both teams’ final regular season game. Marshal King once again had the hot hand for the Rocks scoring 3 times and adding 3 helpers. Ben Preston and Braylon Lumb had 2 goals apiece with Preston adding a couple of assists. Brad McCulley and Skyler Wilson had the other Victoria goals. This will be the match-up for the first round of playoffs and they will start next Saturday in Coquitlam with game 2 to take place Sunday, July 15 at 1:00 pm at the Save-On Foods Memorial Centre. New Westminster will take on the Port Coquitlam in the other semi final series.